I have 2 small raised bed that I will plant veggies in for the first time. Each bed is 4' x 8'. My question is this....How much can i expect to get from what I'm planting? Like, does planting 1 onion set result in 1 onion? I know shallots are like garlic so if I plant 1 shallot set will I get 1 cluster of shallots or will many clusters/bulbs grow? How much would 1 green bean bush produce for the season assuming I pick beans when ripe and don't allow it to go to seed? Same question with brussel sprouts. And lastly, garlic. If I plant 8 cloves should I expect only 8 bulbs to grow? I hope this isn't a stupid question. I don't want to grow too little or too much if I can help it. My initial gut feeling is to plant 2 rows of onions and the same with the shallots. I'm considering sowing loose leaf lettuce in 2' x 4' square to start (I know I have to thin once sprouted), I'm thinking 2 brussel sprout bushes and 2 green bean bushes. 2 of each cherry and large tomatoes and also 2 sweet cherry pepper plants. I'm not sure about my garlic yet. Hey Anna. I'm in Bossier City and have 4x8 beds also. I started with 3 beds 2 seasons ago and now have 9. You wont get many beans from just a couple plants but plant them anyway so you can get a feel for how many plants you may need in the future. If you like your raised beds as much as I like mine, you will add a couple more next year and plant more plants. Corn does real well and you can space it at 1'. Okra too. I spaced my okra at 16". A partial trellis made of fence on one side for cucumbers or pole beans. Just leave yourself room to work. Raised beds are soooooooooo much easier to work and you can control the soil quality too.. Something you can plant right now would be a few red potatoes. Just plant the things yall might like eating. maters, taters, greens, beans, radishes, herbs, etc..........Nuthin tastes better than a fresh salad from your own garden. I don't want to grow too little or too much if I can help it. You can't grow too much in those two beds. Yes, one onion set gives you one onion, but it should be much larger. Yes, one large garlic clove gives you one multicloved bulb. Small cloves may just give you a larger round clove, which if let to grow another year will give you a big bulb. Garlic should be planted in the fall. I have never grown shallots. I would plant at least ten bush beans. You can put them fairly close together; 6". 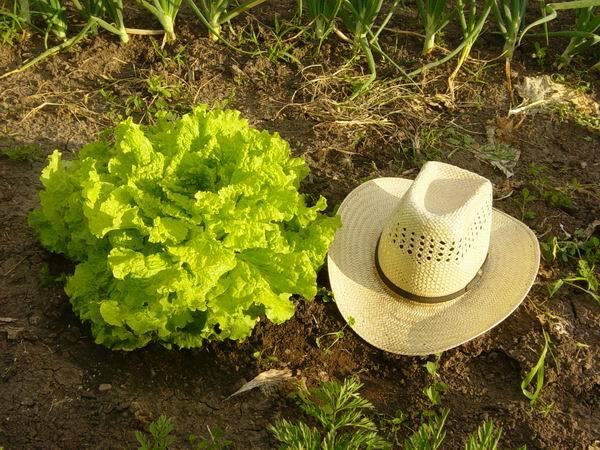 I like to thin leaf lettuce to one plant per square foot. Then I get a nice big head of leaf lettuce instead of the puny little tasteless leaves that you get if its crowded. Plant just three seeds in a spot that you want a head to grow, then it is easy to thin later. Brussels sprouts? I would not even plant that. I am afraid you will be disappointed. Try broccoli or cabbage instead. This is a head of BlackSeeded Simpson letuce. Indoor veggie garden has small flying insects.